For one of my classes this semester I am doing a research paper on smart phone addiction. Did you know that there is actually a new term that has been coined for a person who is obsessed with their phone? Neither did I. But apparently it is a big deal. So big, in fact, that they are proposing to add it to the DSM-V (Which would make it a mental illness). Anyways, the reason why I decided to research smartphone addiction is because I feel like it is a pretty annoying problem; that is if you are not one of the people engaged in the phone call or texting conversation. I don’t know how many times I have been trying to talk to someone but they’re too engrossed in their phone…or I’m behind another car and the light turns green but they’re more focused on their phone. Uh Huh. So yeah, nomophobia. Apparently 66% of smart phone users have it. This means that the odds are pretty decent that you’re addicted to your phone so much that you panic when you realize you don’t have it (ie, you turn your car around the minute you realize you left it at home, you tell people you feel “naked” without your phone when you forget about it, you randomly check your phone for no real good reason other than you realize it’s been a couple of hours since you checked Facebook). Yesterday I was sitting at a red light. While I was sitting at the red light, I glanced at my phone, which happened to be sitting next to me. I have my phone set up so that it will read my text messages and answer my phone calls if either of those happens while I am driving (smartphones are smart, you know?). But I can still use it, because my phone isn’t smart enough to remind me that smart phone usage behind the wheel, even when your car isn’t moving, is illegal. Anyways, as I was sitting there looking at my phone, I realized the light had turned green. So I started driving and realized that the light had not turned green; at least, not for me. The light for the cars turning left (in front of me) had turned green, and we all started going at the same time. All I can say is that I am glad that we all noticed each other. Uh Oh. I am one of those people; the ones I complain about all the time. I’m one of those people; who uses their phone at completely inappropriate times. Oh, and I have gone back home to get my phone and I have admitted that I felt “naked” because I didn’t have my phone and I have randomly checked Facebook when it wasn’t necessary (is checking facebook ever necessary?). Nomophobia. Maybe I don’t have full-fledged nomophobia. Lets just say I have nomophobic tendencies. Ask me what I was checking on my phone. I don’t remember. It wasn’t important. Ask me how far away from home I was. Approximately 2 miles. Ask me how embarrassed I am to tell this story. Extremely. So from now on, my phone goes into my purse when I am driving. There is absolutely no debate with this one. The phone can wait. I will now go back to eating my humble pie. 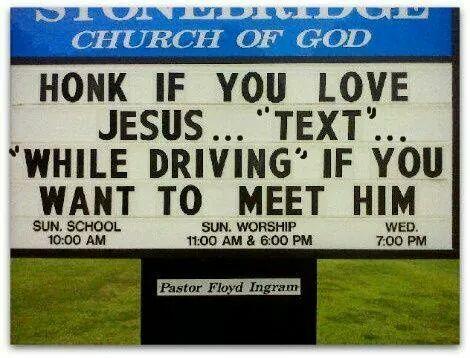 I am getting more and more concerned about mobile phone use and driving. Recently I went for a drive of about 40km, and during that time, three separate vehicles in front of me *crossed over* to the wrong side of the road while looking down instead of at the road. This also made me realise I need to get a new “warning device” or horn, because honestly nobody takes the horn of a Volkswagen Polo seriously. It sounds like a clown car. Three times I beeped, three times nobody noticed. Been there, got the tee shirt, as they say. I have made a pledge, broken once this week, not to touch the phone in the car. Yikes. For a smart phone user, I’m not very smart. Thanks for this excellent post and the great photo. I’m still working on this one but have gotten better. Yesterday a guy doing at least 85 on the freeway was weaving in and out of traffic while texting at the same time. Yikes. Being aware of your actions is half the battle, I think. Next Post Nablopomo Day 2: Yep, I’m Still Smiling.